Stir-fry a simple veggie side using our easy 3-step recipe. Our dressing adds a boost of flavour, ensuring a perfectly seasoned side dish every time. 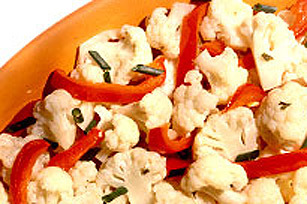 HEAT dressing in wok or large frying pan; add cauliflower and peppers. STIR-FRY for 2 to 3 minutes; reduce heat, cover and let steam 5 to 7 minutes. JUST before serving; sprinkle with green onion.